Izza is a friendly Singaporean who has a huge passion for writing, reading, and community involvement. She loves to travel, whether both in her own country and overseas. She also enjoys learning more about other people, through interacting with them and knowing their stories. She believes art and education is and should be accessible to everyone, and she writes her way towards that belief. Currently an aspiring dietician who studies in the health sector, Nur Shazleen has worked hard to attain latest CGPA of 3.95. As she hustles before she graduates from Universiti Islam Antarabangsa Malaysia, Shazleen is closer to achieving her dream of making healthcare more accessible to low-income families. She tells Skolafund that she is doing well and is incredibly thankful to all her sponsors. Read more about her here! Another aspiring medical student is Affiena. She has worked hard in Widad University College to attain her latest CGPA of 3.72. Thanks to all of her great sponsors, she is able to support her struggling parents while studying today. Her family works hard to raise tertiary students with the intent to improve their community. Click here to know more! Rais studied Computer Animation in Universiti Pendidikan Sultan Idris and is currently a Software Engineer in DHL IT Services. Due to the help he received from Skolafund sponsors, he managed to graduate with an awesome animation film as his Final-Year Project. He now serves the community by generating ideas for the IT sector, while expressing his unique creativity. Learn more here! Mustaqim is one of the first few successfully Skolafunded candidates. Three years ago, he was studying Civil Law in Universiti Islam Antarabangsa Malaysia. Now, thanks to his sponsors, he achieved his age-old dream of praciting law as he is currently a lawyer-in-training. Great job, Mustaqim! Read more about him and a few of his struggles here! Aminah is another medical student who is working hard to be a doctor and contribute back to her society. She is currently maintaining an awesome CGPA of 3.6 as she juggles her studies with side jobs and extra co-curricular activities. Thanks to her sponsors, she is able to sit for her exams and raise some of the burden off her parents’ shoulders. Find out more about her here! When Amirizzudin was hustling hard to attain his Bachelor’s Degree in Mechatronic Engineering two years ago, he was also struggling to provide financial support for his family. Aside from being a bright student who does incredibly well for his studies, he also carries out the duties of being a good son. Skolafund sponsors allowed him to complete his degree and make his family proud. Know more about him here! 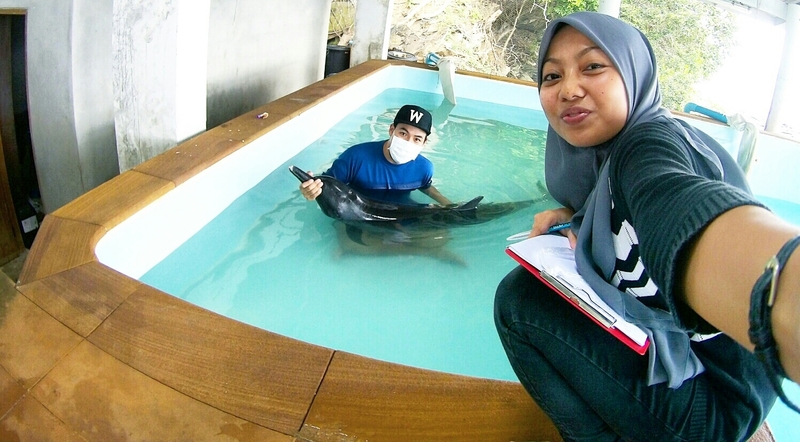 After graduating from Universiti Malaysia Terengganu, Errin furthered her studies in Marine Biology at Bangor University, North Wales. She has passionately contributed a lot of her skills to the marine biology sector, working closely with sea turtles, dolphins, dugongs, and whales. Skolafund sponsors played a huge part in making her realise her dreams. Read more about her here! If you would like to know more about the many other successful Skolafunded candidates and campaigns, check them out here. This Ramadan, Skolafund intends to help even more financially-struggling families and individuals by making education accessible to them. Help us out at The Big Community Scholarship Campaign. Every single ringgit is worth in making these students’ lives better.